I am so excited; my shipment from Forest Grove Botanica arrived on Saturday! What plans I have for the treasures of Forest Grove, courtesy of The Witch of Forest Grove (aka Sarah Lawless). Her wildcrafted oils, smokes, and unguents have found there way into my magickal workings over the course of the last several months and I look forward to many more. The New Hoard - just call me the Dragon of Forest Grove! 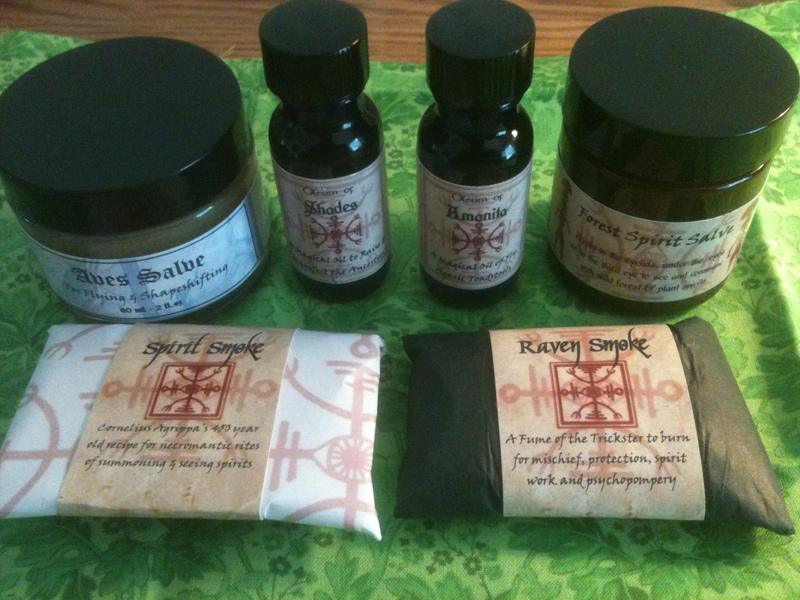 This time around, I ordered the Aves Salve (for shapeshifting into a Barn Owl and Crow), Forest Spirit Salve (for finding and working with the tree and plant spirits in wild places), Oil of Amanita (for journeying/hedgecrossing in general and work with Dionysos and Odin in particular), Oil of Shades (for connecting with Hekate as well as my ancestors), Spirit Smoke (again, for ancestor work), and Raven Smoke (for communing with Crow and seeking out Mercury in his darker aspects). To the Work ahead! Of course, as appropriate, I will map my travels and share the journey here! This entry was posted in Spirit Work by Wandering Woman. Bookmark the permalink. Yay! How awesome is that! I can’t wait to begin working with her wonderful oils, smokes, and unguents.